Nancy Knop, an integral member of the Health and Human Kinetics faculty for 16 years, died of brain cancer in Minneapolis on Feb. 2. She was 63. Ever the healthcare professional, Knop participated in a clinical trial through the University of Minnesota as part of her treatment. The trial combined the injection of a virus genetically engineered to infect brain cancer cells and a drug designed to destroy virus-infected cells, in an effort to avoid many of the toxic effects associated with traditional chemotherapies. Knop was born Dec. 3, 1956 in Red Bud, Ill. She attended the University of Illinois, where she settled a lawsuit to give female athletes the same opportunity and budgets as men. She earned a master’s degree in exercise physiology/biomechanics at the University of California-Davis. 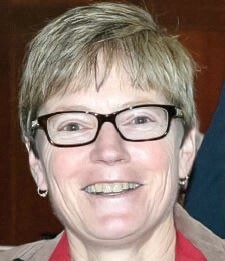 Knop also served for three seasons as an assistant women’s track and field coach, during which time OWU won two North Coast Athletic Conference outdoor championships and had four All-Americans. She also created the FitOWU health and wellness program. A celebration of her life will be held in Delaware in the early fall. She is survived by her parents, Edward and Barbara Knop, an aunt, her brothers and a sister, and their families, including her nieces and nephews.